Winter birding? How many birds can you see in the winter? Haven't most of them flown south? I had these and more questions for Jim Fairchild two years ago when he encouraged me to join the winter birding competition he has been participating in for years. Our past few years of winter and year list birding together has been described as "extreme birding". We chase everything that we hear about. You don't need to participate to this degree but keeping a winter list and challenging yourself to get out regularly and can be both healthy and enjoyable. The scheduled club outings should expose us to the various gull species, feeder birds and wintering waterfowl. Daily feeder watches or regular trips to woodlots, creeks and the lake are great ways to find and identify over-wintering birds. Early winter has the straggling late migrants and late winter even has the early returning migrants. Let me know if you are going to try winter birding this year and I'll try to keep you posted on any local rarities. Who knows? Maybe another Rose-breasted Grosbeak will show up at Barbara Welch's feeder this year? Maybe the Carolina Wrens will stay in the valley near Karin Fawthrop's home? Either way, there will be some surprises this winter. Maybe you will be the one to find them. In the last issue, I tried to encourage all the birders in the club to participate in some form of birding this winter. I want to continue that process with the help of some brief descriptions of good winter birding spots in our area. For the record, I define "my area" as Ontario and I keep an Ontario winter list as well as a 50km Toronto circle list. You can define any area as yours – your backyard, the local park, Pickering, Durham, etc. Defining your area isn't important – getting out and seeing the birds is. Usually good for both dabbling and diving ducks until freeze up. Once the bay freezes, the area is the best local spot for the various gulls wintering there. On a good day (a scope helps), you can get six species of gulls - Iceland, Glaucous, Great Black-backed, Lesser Black-backed, Herring, as well as the ubiquitous Ring-bills. The best place to view the bay is from a parkette on the east side. Exit highway 401 at White's Rd., then go south 0.3 km, then left on Bayly St. Go east on Bayly to Liverpool Road. Turn right on Liverpool and proceed south to Commerce Street. Turn right on Commerce to Front Road. Turn left on Front and then right into the parkette parking lot. Alternately, exit highway 401 at Brock Street and proceed south to Bayly and then west to Liverpool. The east side of Corner Marsh is another good spot for waterfowl both in the marsh and on the lake. Gulls also congregate at the mouth of Duffins Creek even after freeze up. Exit highway 401 at Westney Road, then south on Westney to Lake Driveway West to Rotary Park. Cranberry Marsh has the usual complement of waterfowl until freeze up. The lake (accessible from the south trail off Hall's Road) has yielded Common and Red-throated Loons, Snow Goose, Horned and Red-necked Grebes. Large rafts of Greater Scaup, Red-breasted Mergansers, as well as Bufflehead and Common Goldeneye are usually present. All three swan species – Mute, Trumpeter and Tundra – have been observed on the lake in early winter. Owls – Barred, Short-eared, Long-eared, Saw-whet, Great Gray – have been seen in and around the woods and fields along Hall's Road. 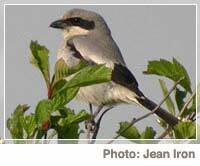 Northern Shrike regularly appears in the area as do wintering sparrows – primarily Tree Sparrows but Juncos, Song and Swamp Sparrows regularly winter over. Early winter could see Lapland Longspurs feeding along the roadside. Exit highway 401 at Salem Road, south to Bayly, east to Hall's Road (one road east of Lakeridge, Bayly becomes Victoria at Lakeridge) or exit 401 at Brock Street in Whitby, south to Victoria and west to Hall's Road (first road south past Lynde Shores Conservation Area). The Lynde Shores woodlot sometimes has over-wintering Red-winged and Rusty Blackbirds to complement the "marauding hordes" of Black-capped Chickadees. This area is a great place to let your children or grandchildren feed these very tame little birds. Mitts are recommended for the little ones – the feel of the bird's claws may cause them to flinch and scare off the bird. There is a path going down to Cranberry Marsh south from the woodlot. Short-eared and Long-eared Owls are a possibility. b)	The locals are very protective of their private road and discourage pedestrians using it rather than walking the paths. Exit highway 401 at Salem Road, south to Bayly, east to Lynde Shores Conservation Area (Bayly becomes Victoria at Lakeridge) or exit highway 401 at Brock Street in Whitby, south to Victoria and west to Lynde Shores Conservation Area. The harbour and the Pringle Creek area has many waterfowl and gulls until freeze up. Brant and Sandhill Crane have been observed in early winter in the Pringle Creek. Northern Mockingbirds have regularly wintered over in the evergreens along South Blair Street Exit highway 401 at Brock Street in Whitby, south to Pringle Creek (just south of Front Street) and further south to the parking lot overlooking the harbour. South Blair is one street east of Brock Road just past the Heydenshore area. Most of these sites concentrate on waterfowl and gulls but there are many seed eaters that come to feeders in the Pickering, Ajax, and Whitby area. Doug Lockrey's January Feeder Tour will stop at the best locations – they are too numerous to list here. There are many other places to go if you are more adventurous. 1. Niagara Falls and the River for thousands of gulls that are there in November/December. You might even see Purple Sandpiper on the rocks above the Falls. 2. Western Lake Ontario is a great place for waterfowl – everything from Humber Bay Park, through Colonel Sam Park, to Bronte and on to Burlington and Stoney Creek lakeshores. Note that the February outing will cover Bronte through Stoney Creek and the March outing will stay closer to home and cover Colonel Sam, Humber Bay and also Ashbridges Bay (if the area is still frozen, winter gulls congregate on the ice). 3. Algonquin Park for northern specialties – Boreal Chickadee, Gray Jay, Spruce Grouse, Black-backed Woodpecker, White-winged and Red Crossbills, and Evening Grosbeak. I hope this will give you a sense of the variety and adventure that is available to the winter birder. Every year gives new surprises – a Snowy Owl in urban Whitby (2007) or a Rose-breasted Grosbeak at Barbara Welch's feeder in Scarborough (2007/2008) or a Great Gray Owl on Shoal Point Road (2008). Maybe this year you will find the season's surprise bird. I encourage you to get out and get involved in winter birding on your own or with the club outings and our Christmas Bird Count. Dress warmly. Get out and look. You never know, you could turn into a winter birder too. The Robins, Killdeer, Grackles, and Red-winged Blackbirds have already arrived. Tundra Swans, Gadwall, Ring-necked Duck, Green-winged Teal, Northern Shoveler, Wood Duck, Canvasback, Pintail, and American Wigeon are passing through. They will be followed by Tree Swallow, Pied-billed Grebe, American Coot, Eastern Bluebird, American Woodcock, Rusty Blackbird, Hooded Merganser, Belted Kingfisher, Eastern Meadowlark and Brown-headed Cowbird. Late March should bring Blue-winged Teal, Horned Grebe, Winter Wren, Eastern Phoebe, Great Blue Heron, Ruddy Duck, Hermit Thrush, Fox Sparrow, Northern Flicker and Bonaparte's Gull. Double-crested Cormorant, Chipping Sparrow, Yellow-rumped Warbler, Pine Warbler, Common Tern, Caspian Tern, Blue-gray Gnatcatcher, Purple Martin, Brown Thrasher, Swamp Sparrow, Osprey, Bank Swallow, Rough-winged Swallow. Lincoln's Sparrow, White-crowned Sparrow, Magnolia Warbler, Cerulean Warbler, Northern Parula Warbler, Ovenbird, Common Yellowthroat, Black-throated Blue Warbler, Blackburnian Warbler, American Redstart, Orange-crowned Warbler, Tennessee Warbler, Golden-winged Warbler, Cape May Warbler, Chestnut-sided Warbler, Red-eyed Vireo, Warbling Vireo, Least Flycatcher, Eastern Kingbird, Bobolink, Swainson's Thrush, Gray-cheeked Thrush, Veery, Ruby-throated Hummingbird, Least Sandpiper, Black-bellied Plover, Short-billed Dowitcher, Great Crested Flycatcher, Northern Oriole, Orchard Oriole, Indigo Bunting, Scarlet Tanager, and Black Tern. Yellow-bellied Flycatcher, Willow Flycatcher, Alder Flycatcher, Eastern Wood Pewee, Wilson's Warbler, Philadelphia Vireo, Canada Warbler, Bay-breasted Warbler, Mourning Warbler, Connecticut Warbler, Blackpoll Warbler, Black-billed Cuckoo, Yellow-billed Cuckoo, Common Nighthawk, Sanderling, Ruddy Turnstone, Semi-palmated Sandpiper, Semi-palmated Plover, and Whimbrel. Birds continue to migrate into mid-June with the females (non-singers and more difficult to identify) having moved through. Local birds will have moved onto breeding territories and established nests. Early nesters will be fledging young and the summer will be upon us. Birding is a year-round activity, in the Pickering/Ajax area and adjacent locations that can appeal to a broad range of participants. Young and old, novice and experienced, families or individuals can enjoy the many birding areas and participate at their own pace whether feeding chickadees or locating a local rarity. From the Lake Ontario shoreline with its local bays and marshes, to the river and creek valleys, to farm lands and remaining forests, they all provide opportunities to appreciate the many bird species that occur, for at least part of the year, in our area. Spring (late March through early June) is prime time for seeing the many north-bound migrants that pass through our area on their way to more northerly locations. Some do stay the summer though and can be seen in our local sites. Fall brings the southbound migrants returning to their wintering territories – most going further south but many ducks, gulls, as well as some sparrows stay to winter in our area. While it's impossible to guarantee that certain species will occur in an area, the list below indicates in general where the birds occur. Although summer is still with us, it’s time to think of fall birding. Breeding and most bird song ends in July. Southbound migrants (particularly shorebirds) are already returning. Swallows are starting to be conspicuous on wires as they get ready to return south. Greater and Lesser Yellowlegs, Least Sandpiper, Semipalmated Sandpiper, Semipalmated Plover, Solitary Sandpiper, Stilt Sandpiper, Pectoral Sandpiper, Sanderling, and Short-billed Dowitcher are already moving through and can be found in appropriate habitat. These will soon be followed by Black-bellied Plover, Ruddy Turnstone, and possible Wilson’s Phalarope. Expect to see songbirds in late July/early August – Swainson’s Thrush, Least Flycatcher, Ovenbird, Tennessee Warbler, Northern Waterthrush, Yellow-bellied Flycatcher, Alder Flycatcher, Yellow Warbler, and Black-and-white Warbler. By mid-August, significant numbers of insect eaters are possible. Expect Blackburnian, Chestnut-sided, Cape May, Wilson’s, Mourning, Canada, Magnolia, and Bay-breasted Warbler along with Scarlet Tanager, Rose-breasted Grosbeak, and Veery. Additional shorebirds may include American Golden Plover and Buff-breasted Sandpiper. Early raptor movement – Broad-winged Hawk, Osprey, American Kestrel – may be evident. Additional species could include Philadelphia Vireo, Nashville, Black-throated Blue, Black-throated Green, Blackpoll and Yellow-rumped Warblers. Bonaparte’s Gulls and Common Terns usually occur in Mid-August. Purple Martins, Northern Rough-winged and Barn Swallows are seen in large numbers from mid to late August. Baltimore and Orchard Orioles usually disappear by month end. Eastern Kingbirds move through by the end of August. September usually gives us the peak of most southbound numbers. Early September has Sharp-shinned Hawks, Ruby-crowned Kinglets, Palm Warblers, Buff-breasted Sandpiper and Gray-cheeked Thrush moving through. By mid-September, expect Turkey Vultures, Cooper’s Hawk, White-throated Sparrow, Lincoln’s Sparrow, Dark-eyed Junco, Yellow-bellied Sapsucker, Hermit Thrush, Winter Wren and Solitary Vireo. Large numbers of Broad-winged Hawks can be seen after a passage of any cold front in during mid-September. Late September brings Dunlin, Orange-crowned Warbler, American Pipit and Rusty Blackbird. There will also be a significant migration of Blue Jays. They can be observed flying parallel to the Lake Ontario shoreline since they will not cross a significant body of water. This is the phenomenon also that makes Cranberry Marsh an excellent area for observing migrating raptors from late August through the end of November. October usually ends the migration of the insect eaters – warblers, vireos, flycatchers, swallows, and thrushes. Fox Sparrow, Eastern Bluebird, Pine Siskin, Lapland Longspur and Red-shouldered Hawk move through. Ducks start arriving – Canvasback, Greater and Lesser Scaup, Ruddy Duck, and White-winged Scoter. Late October brings Rough-legged Hawk, Saw-whet Owl, Snow Bunting, as well as Common Goldeneye, Bufflehead, and Common Merganser. November: The killing frosts of November typically end the migration of most species but rarities can show up – Purple Sandpiper, Harlequin Duck. December is usually for “diehard birding” but you can be rewarded with Snowy Owl, Glaucous Gull and other wintering species. Also, don’t forget the Christmas Bird Counts. Both the Pickering Naturalists and the Durham Field Naturalists conduct counts during this season. In Toronto – Between December 14 and January 5, 2015, thousands of experts and amateur birders will participate in the annual Christmas Bird Count, a well-established tradition for naturalists across the continent. This year, more than 40 Ontario Nature member groups are leading bird counts in communities as far north as Thunder Bay, to Holiday Beach in the south, and Kingston and the Ottawa area to the east. The Christmas Bird Count started out as the Christmas Bird Census led by American ornithologist Frank Chapman as an alternative to the then-popular “side hunt” in which teams competed to see who could shoot the most birds and small mammals as a Christmas day activity. Chapman’s suggestion that birds be counted instead of shot changed the course of ornithological history with the founding of what is now considered to be the world’s most significant citizen science-based conservation effort. Bird Studies Canada coordinates the count in Canada in a joint program with the National Audubon Society. Counts are open to birders of all skill levels. The data is used by Bird Studies Canada, the Canadian Wildlife Service and the National Audubon Society to monitor the status of all bird species across the western hemisphere. Today, more than 2,000 individual counts are scheduled to take place throughout the Americas, and more than 100 counts will occur in Ontario alone. During last year’s Christmas Bird Count, nearly 58,000 volunteers across North America tallied some 70 million birds. This year’s Christmas Bird Count is expected to be even larger. For a full list of the Ontario Nature member groups that are holding bird counts and when, please visit the Nature Network page on our website. In 2007, 11,565 participants in Canada counted more than 3.2 million birds in a record-high 371 counts. Biologists around the world use the data collected from the counts to monitor the populations and distribution of North American birds. Some of it has revealed serious declines: the decision to list the Newfoundland red crossbill and the rusty blackbird under the federal Species at Risk Act was the result of data collected from Christmas Bird Counts. More than 55,000 volunteers from all 50 states, every Canadian province, parts of Central and South America, Bermuda, the West Indies and Pacific Islands, count and record every individual bird and bird species seen in a specified area. In recent years, Christmas Bird Counts have shown declines in northern shrikes and Harris’s sparrow (both by nearly 2% a year).